Michelle at the cliff top with the background of Am Buachaille far below. First, the original and archetypal goal of climbing is to go high, perhaps up to the (locally) highest point, and preferably somewhere unreachable without climbing. In the UK, Napes Needle in the Lake District is the first recorded climbing in that respect, that is, climbing for the sake of it, rather than a means of training for bigger objectives like Himalaya. Sea stacks are of course an ideal objective, being independent and eye-catchingly distinctive. Not to mention, those pros serve at the same time as cons, or added risks. Sea stacks were formed as a stack with a good reason, that is, the rocks are not the most solid, even exacerbated by the harsh coastal climate. Famously, a British climber Paul Pritchard has suffered a serious injury due to a rock fall during his attempt of climbing The Totem Pole in Tasmania, which left him in hemiplegia. The challenge to climb a sea stack should not be underestimated. The Souter in Scottish Border. Then sea stacks naturally draw my attention. However, I have climbed only one stack so far — The Souter in Scottish Border. It was good, and better than Rivelin Needle, Terrier's Tooth and alike. Nevertheless, I know it is nowhere close to the best that Britain, or mostly Scotland, can offer. There are many sea stacks in the coast in Scotland; among those, the so-called Big Three are, Old Man of Hoy in Orkney, an Old Man of Stoer and Am Buachaille in the far north-west Highlands. They are the biggest major sea stacks in British Isles, with Hoy being the tallest at 137m (see note about the height of sea stacks in British Isles). The fact all of them are remote from major areas in Britain means the logistics are not easy for most people, including most Scots, let alone those from the south. 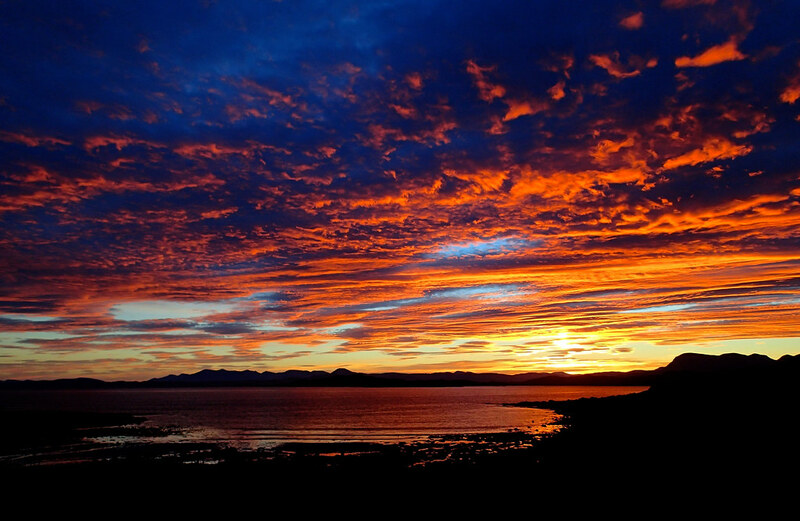 The Scottish weather is anyway not renowned for being mild or dry to say the least, and the north-west coast tends to be the worst in Scotland. That means even if one makes everything else in the logistics right, it is fairly common they are turned down by the weather. 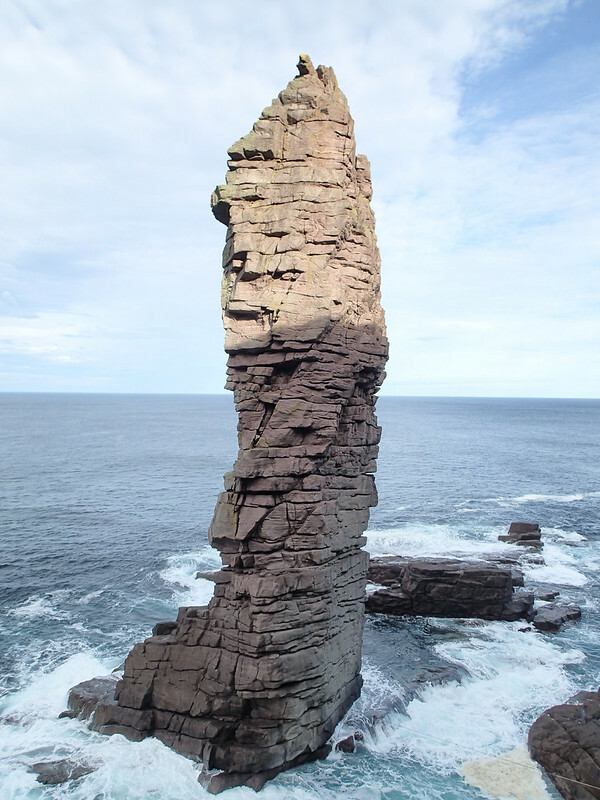 As such, the level of commitment and effort is high in the Scottish sea-stack climbing. But the reward must be all the higher, if one succeeds. Old Man of Hoy from the viewpoint at the cliff top. Logistics is often a big part in the Scottish sea-stack climbing, and certainly for the Big Three, as all those three are remote. In the ideal world, the order would be Old Man of Stoer and Am Buachaille, which are located fairly close to each other, followed by Old Man of Hoy in Orkney, the route of which is technically the hardest and longest. With that order, the travelling time by car and boat/ferry would be the minimum, and climbers could (almost hypothetically) complete the three in 3.5 days (plus driving from/to home). Also they would start easy and go progressively harder. Between Old Man of Stoer and Am Buachaille, although the former (Stoer) is technically slightly harder in the guidebook climbing-grades, the latter (Buachaille) is far more serious (as described in detail later), and so practically overshadows the former (Stoer) in the overall difficulty. 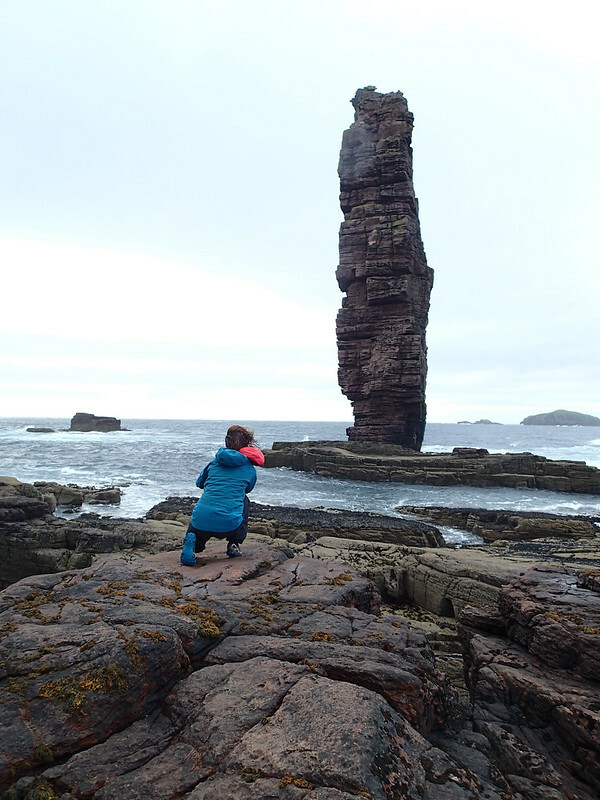 In that sense, ideally, Stoer suits better to be climbed first for acclimatisation to the sea-stack climbing. However, the weather and the tide time-table dictate differently in our case. Our first day of climbing is Saturday, after wet Friday. The forecast seems dry enough on Saturday and the most promising on Monday and perhaps Tuesday, while Sunday in between seems wet. Our number-one priority is Old Man of Hoy, the most iconic sea stack of all in Britain, which needs 1 day of travel just to get there. Then, it makes sense to travel on (wet) Sunday to get to Orkney to give a shot at Hoy on Monday, with Tuesday as a spare day. In terms of the tide, it is spring low-tide at 2:24 pm on Saturday for the west coast of the north-west Highlands. That is ideal for Am Buachaille. But if we attempt it the following mid-week after we come back from Hoy, the low-tide periods will be partly in the dark and the tides will be higher due to being closer to the neap tide. Good weather in forecast, though too far ahead to be certain Spare day for Old Man of Hoy, or if everything has gone well, we will come back to Britain main land and travel to NW Highlands. Last day of climbing, but only for half a day. 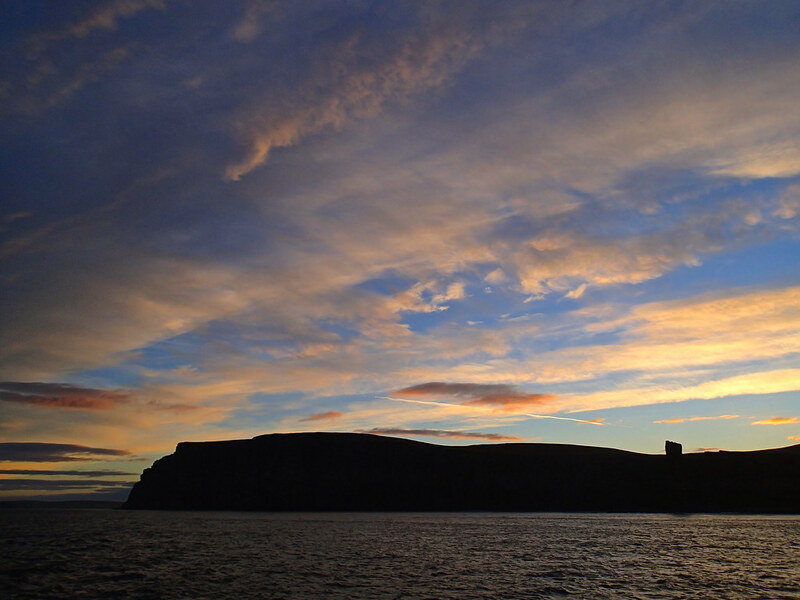 Sunrise over Hoy, shot from the ferry from Stromness, Orkney to Scrabster. Am Buachaille, shot after our climbing. Am Buachaille is allegedly the most serious one among the Big Three, and certainly is least visited or climbed, as the UKC logbook clearly shows, even though the grade given in the guidebooks and length of the climb are the easiest and shortest, respectively, among them. The rock is soft sand-stone and so is anticipated to be not very trustable with unreliable gear. It was farther north than Old Man of Stoer, the walk-in is the longest among the three, and more than anything else, a timely and swift ascent while the tide is low and while the sea is calm enough is essential, with mandatory swim-in and out (unless you use a boat/kayak/inflatable). It is because a Tyrolean bridge is highly impractical or virtually impossible to set up, and because the almost entire platforms of both the foot of the stack and the opposite shore, from which you swim, are submerged under water in the high tide. That means even if you managed to cross the wide channel in the high tide by a long swim (with heavy gear) to come back to (the base of) the main land after the climb, it would be extremely problematic to go up back to the safety, because you would need another hundreds of metres of wading/swimming to get to the bottom of the approach gully to scramble up. In short, if you miss the low-tide period to come back, you may have to wait for several hours to pass the high tide (or perhaps longer, if you don't have a waterproof head torch with you for the night-time channel crossing, or worse, if the sea gets rough while waiting) at either the top of the stack or one of the belays (but not the bottom one)! In comparison, although Old Man of Hoy is quite far away and awkward to get to (unless you already live/are in Orkney) majorly due to its remoteness from the main-land Britain, there is no issue of the tide with no swimming involved, and the rock/gear is better. Old Man of Stoer (may) needs swim-in, too, but you can come back via Tyrolean-bridge any time safely, and if you are lucky, there may be an in-situ Tyrolean-bridge, which would eliminate the need of swim-in, too. The rock of hard sandstone is well trustable, too. Bivouacs have been had on the summit and teams have been swept a long way down the coast. (in The Top 10 Sea Stacks in Britain). The approach (from the nearest carpark) is the longest among the Big Three — 2 hours (to the cliff top), according to a guidebook, if walking in. We took bikes to shorten the approach time, and we appreciated them, even though they were a knackered town-use bike and a road(!) bike, which were all I had, and so we pushed the limits of their use on the off-road track, and sometimes the bikes. We still needed a fair amount of walking after the bikable track to get to the cliff top, and then made the dodgy scrambling descent in a gully. As it turned out, it was the worst descent by a good margin among the Big Three, with crumbling rocks and slippery grass — nearly nothing on the ground was solid or trustable. Then, the arduous and precarious hopping on sea-washed and often slimy boulders followed. It took us 70 minutes for the descent, or 2.5 hours in total from the carpark, to get to the opposite shore of the stack. The tide was close to the lowest when I dived in water, and only a few metres of crossing with the water level up to the belly at the deepest was all I experienced, as I was lucky enough not to miss the (murky) underwater rock. After pulling the clothes to change and gear in 2 waterproof bags, Michelle followed in wet-suits with a poorer luck as I had, missing the rockbed, and swam for 2 metres. A good thing was the sea water was pretty much the warmest at this time of a year. Michelle on P1 of Original Route, Am Buachaille. Sandwood Bay far in the background, which is a relatively popular destination for walkers as a part of Cape Wrath Trail, and is a good view point of Am Buachaille. The tide is just after the lowest, and is in a spring tide. The both sides of the bottom platforms are submerged in the high tide. By the time we had changed the clothes and geared up, we were well behind the schedule — we planned to cross the channel 1.5 hours before the low tide — majorly because the approach had taken much longer than expected. Our original plan was to climb the VS variation (Landward Face) of Original Route (HVS), the former of which is, as found out later, actually far more popular than the original, according to the UKC. However, the line of Original Route (HVS) looked much more obvious from below, than the wiggling VS (the guidebooks we took were a little contradictory to each other in descriptions anyway). Considering the time constraint, I took the lead of all the pitches (P1 and P2+3 combined), and chose the harder but more obvious Original Route. Anyhow, even without the time constraint, the preceding experience of soft and crumbling rocks in the descent gully seemed to have freaked out Michelle to take a lead, understandably and probably sensibly — the rock of the stack was indeed soft, sandy, and even crumbling in places. Careful approach was most desirable, that is, a patient search for the best hold even on a steep terrain in a strenuous position — a bit like a (hard) mixed climbing in winter. The gear was pretty sparse, and the reliability was in question. The guidebooks say P1 is tech 4b, and P3 is "easily to the top" at 4c. I confirmed the technical grades, as I lead, but found not much gear and big run-outs. The 4c move in P3 was definitely not easy for the grade. Ordinary VS leaders would have a hard time. Fortunately the climbing was well below my grade, including the crux P2 at 4c-5b (depending on the guidebooks! ), and I eventually topped out, followed by Michelle, in a good time to our joy. It is yet half a story in sea-stack climbing, though. We have to go back! By the time we have abseiled to the bottom, the first wee ledge we had landed in our swim-in had been already well submerged under water due to the higher tide. This time a proper swim for 15m is in order via a different line from what we took in the swim-in, so as to choose easier landing at the other end. We managed swim-out without a drama, quickly changed clothes, packed up, walked out, before the tide would wash out the platform and boulder field, and scrambled back up the unstable gully to the cliff top, then walked and biked out. It was not a short day. But one stack was down, and we were pleased and satisfied! A funny thing is only the things we talked during and after walking-out were how adventurous the approach in and out had been, and it was only many hours later we started talking about the actual climbing itself! The sea-stack climbing is definitely an exciting adventure. The climbing part is not necessarily the primary one, but does it matter? And it was physically, as Michelle put it, a bit like super-triathlon; we drove, biked, walked, scrambled, swam, climbed and then reversed them all, substituting climbing with abseiling. It is a rich experience! Bike out. Return of a hero! Super-triathlon day(!?) of attacking Am Buachaille. I thought Am Buachaille would be tough for me as the first climb after a traumatic accident. As expected, I was scared with poor protections and unreliable soft sandstone – I would have much preferred harder climb but with solid rock and good protections – though technically the climbing wasn't difficult. The long walk-in was tough on my still injured body, and I constantly lagged behind Michelle. However, the thing is once the goal has been set in an outdoor activity, what one should do is often dictated by the natural conditions of the day(s) like the weather and tides, which we accepted. I bit the bullet, succeeded, and have now got a confidence to go through this challenge of the Scottish sea stacks! 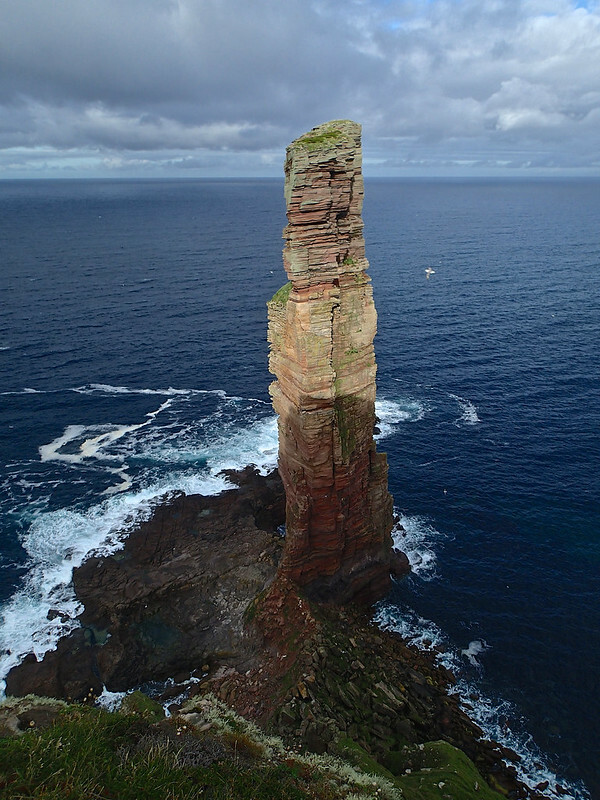 Old Man of Hoy is undoubtedly the most famous sea-stack in British Isles (note that technically it is not a sea stack, for it is connected to the land with a land bridge even at the highest tide). It is situated in the small island Hoy in Orkney, but one can see it (the upper part of it) even from the port Scrabster in the mainland Britain on a clear day. It is 137m high and is the tallest among the major (climbable) sea stacks in Britain. The tallest sea stack in British Isles is Stac an Armin (196m), followed by Stac Lee (172m), both in the very remote St Kilda. However, climbing there is strictly regulated due to nature conservation. They are nowhere close to vertical and reportedly are fairly easy to climb, and hence are far less appealing as a climbing objective than the Big Three. Have you ever climbed Old Man of Hoy? to which he always had to answer "No". Many years later PP finally made it, and got almost in tears, as his climbing partner testified. Since its first ascent, numerous climbers have scaled it by now. Most of loose rocks must have gone from the standard route(s). However, Old Man of Hoy as seen today did not exist mere 250 years ago — it was then not detached from the main island as a distinctive stack (see Wikipedia)! That tells the rock is not the most stable. You had better climb it before it falls down to the sea!? In terms of climbing, the given grade for the easiest route (Original Route, aka East Face Route) is the hardest at E1 up to 5b among the Big Three, which is something to consider. (A geeky note): The ID number of this route in the UKC ( UKClimbing.com , the definitive site for climbing in the UK) is 1, out of hundreds of thousand routes registered in the UKC database!! The fact it is located in the small island Hoy in Orkney poses a logistics challenge to the vast majority of Brits, mainland-Britain dwellers. There is no direct ferry or boat, let alone flight, to Hoy from the mainland Britain. The standard way to access Hoy is to take a ferry from Scrabster (in the Britain mainland) to Stromness in Orkney Mainland, and then to take either a passenger boat to the north-east end (Moaness) or another ferry to the southern end of Hoy. 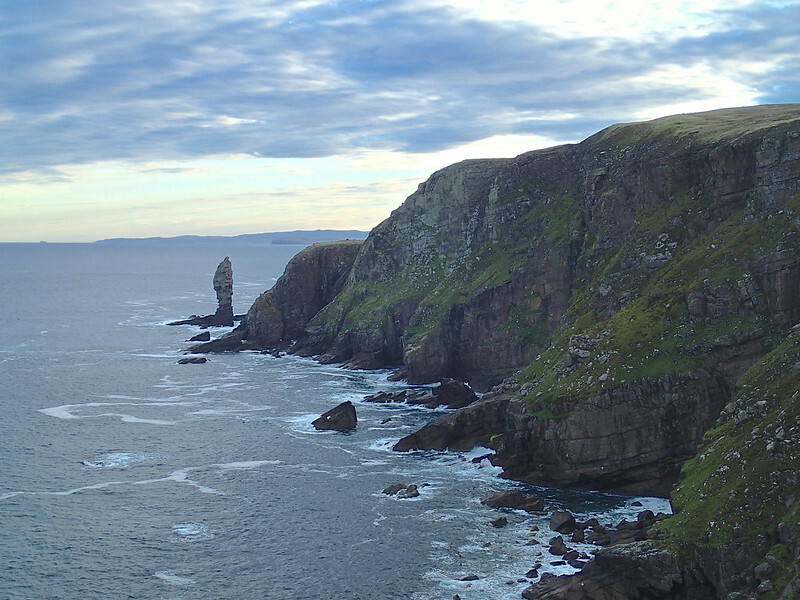 Old Man of Hoy is located at the north-west coast of Hoy. Its nearest settlement Rackwick is 9km away by surfaced road (or slightly shorter via off-road footpath) from the Moaness pier, or much farther from the southern end. An hour or so walk from Rackwick will take you to the view point of Old Man of Hoy at the cliff top, from which point the foot of the stack is reached with a descent on a steep grassy slope. The standard strategy is to stay in Rackwick (bothy or youth hostel or else) overnight either the previous day of or after the climb (we planned the former). Unless you charter a boat, it is (I think) impossible to access and climb it and come back to the mainland Britain in a day. Michelle on the ferry to Stromness, Orkney Mainland, from Scrabster. After our successful climb in Am Buachaille and overnight stay in the camping spot in Sheigra (it is basic — nice and hot shower we had expected wasn't there, or in fact there was literally nothing, even fresh water, but grass field and sea), we drove to the port Scrabster to catch the midday ferry to Stromness, Orkney, and only found ourselves to arrive at the ticket office of the port 5 minutes after the last call and to see the ferry closing its gate…. Our schedule was screwed. It was then impossible to get to Hoy on the day and to stay in the bothy. After killing time for 6 hours in Scrabster, we took the evening ferry to Stromness with no car, and settled ourselves in a campsite near the port. Our updated plan is a light-weight and fast approach to do Old Man of Hoy in a day from Stromness to Stromness. The schedule is much tighter now, due to the constraint of the boat time-table. We will have only 10 hours on the Hoy island. If something goes wrong, we will be screwed with no bivvying kit. The upside is, however, we are not carrying any bivvying and cooking equipment and extra food during the long approach, but just a day climbing gear. It felt almost like alpine climbing!? After a wet night as forecast, the day broke out with blue sky. 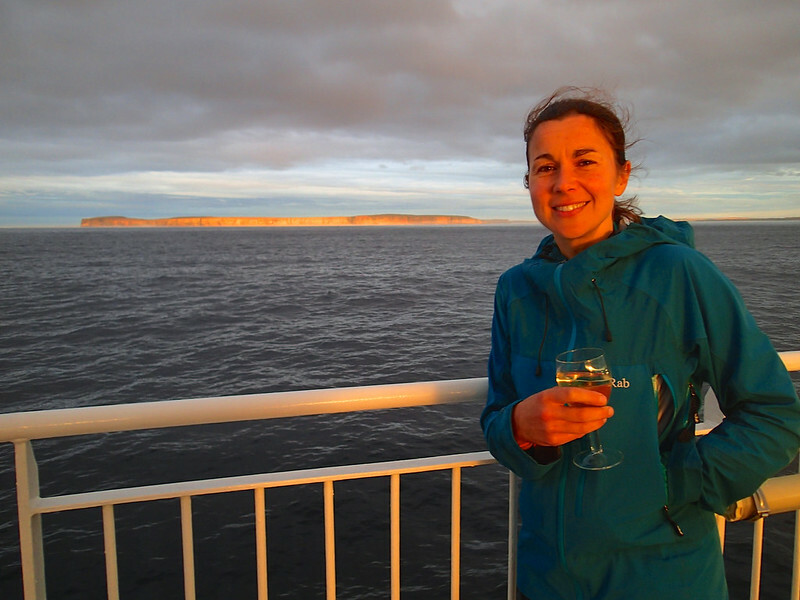 We got on the morning passenger boat to Hoy, taking our bikes, and started our approach. It took only 30 minutes for 5-6 miles — power of cycling! And 2 hours later, we were on the route. So, we would have 50 minutes per pitch for 5 long pitches (135m of climbing), plus 1 hour for abseil. 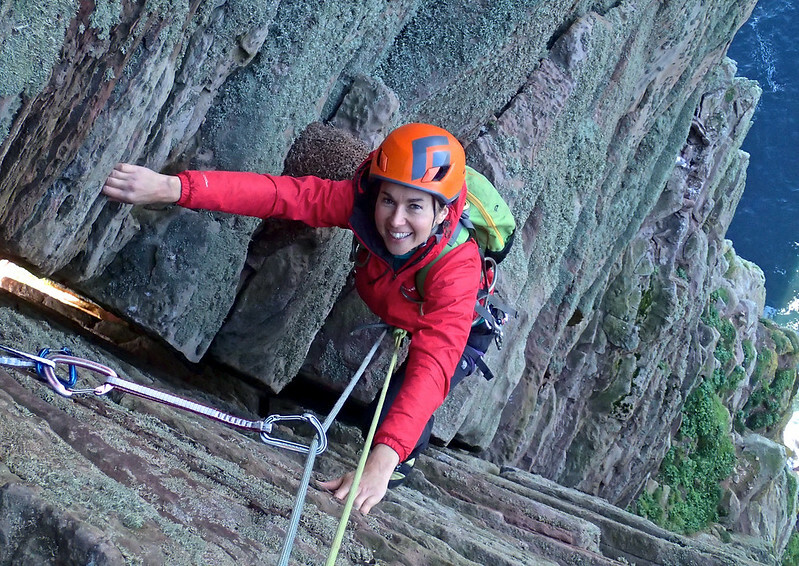 Michelle on the superb top pitch of Original Route (East Face Route), Old Man of Hoy. After Michelle blasted through P1, I took on the crux 5b pitch, P2. It was a great "traditional" pitch! The guidebook recommends 2 sets of Size 3.5 and 4 Friends, which says something. At one stage, my helmet got stuck in the chimney, and I had to shake my head hard to release it. Another great, even better, pitch was the final corner pitch (P5) at 4c. A friend of mine said it was the greatest 4c pitch he had ever done anywhere. Unlike other pitches, it was very well protected, too. It was a pure joy to climb it and top out to the sun! We completed the ascent in roughly 3 hours. Abseiling took 100 minutes for mere 2 pitches, as the rope managed to get stuck in the (straightforward-looking) last pitch. Nevertheless we later had the luxury time to be bitten by midges alive at the pier for well over an hour, before the boat came and rescued us to leave Hoy. 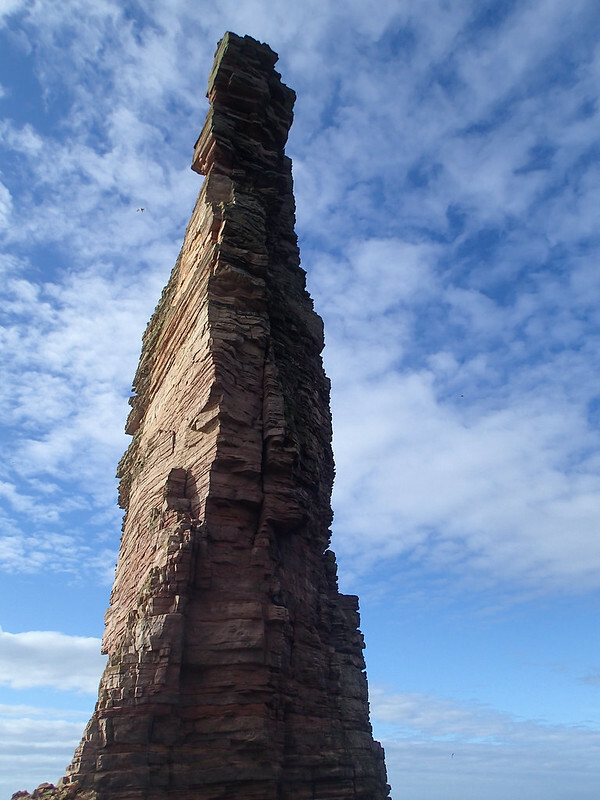 Old Man of Hoy is such an iconic and fantastic-looking pinnacle. It requires a considerable effort just to get to the bottom (and come back). The experience alone is not bad. And the climbing was actually the top quality at least in 2 pitches, which was well beyond my expectation. It really is marvellous. I can not recommend it enough to any climber up to the challenge! 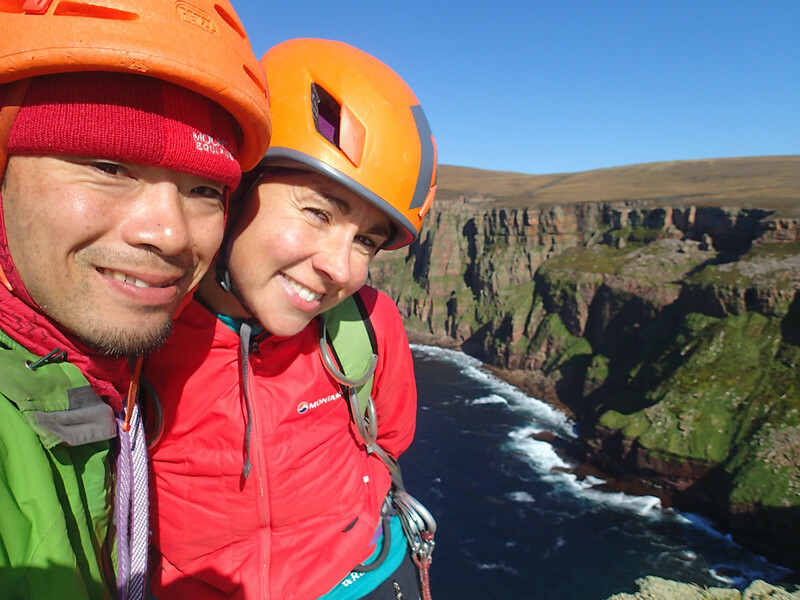 Summit selfie at Old Man of Hoy. 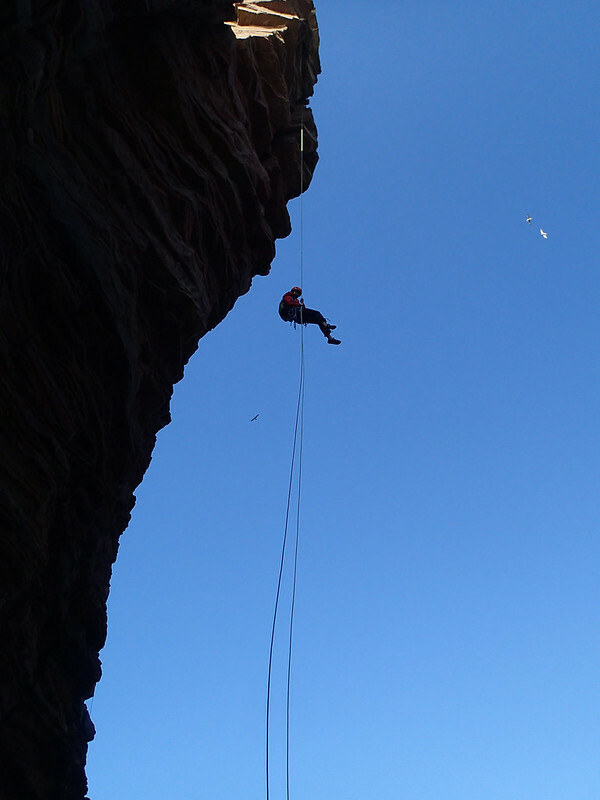 Michelle abseiling off Old Man of Hoy. Old Man of Stoer in the morning from the distance. Old Man of Stoer is situated in the north-west Highlands, north of the famous Reiff seacliffs. It is marginally closer from the south than Am Buachaille, but is still a very long way. The walk-in is the shortest among the Big Three. To access the stack, 8m of channel has to be crossed by either swimming or inflatable. The first person who has crossed the channel can set up a (retrievable) Tyrolean bridge above the high-tide line for the other members, and for the team to come back safely at almost any sea conditions or tide. In fact, Tyrolean-bridges are often available in-situ, and so chances are you do not need swim-in, either. The guidebook climbing grade of Original Route is VS, up to 5a. The crux 5a pitch is the P1 and traverse above water. The rock (Torridonean hard sandstone) is the most solid among the Big Three, and is trustable. Relative ease of access (drive and approach), ease in climbing grade, and comparatively less serious situation make it, as I understand, the most popular sea-stack among the Big Three. Climbing, or better called waiting game? Michelle stepping out from the top out of the local classic route Stepping Out, Latheronwheel. It is a wee scary jump! On the following day of climbing Old Man of Hoy, after landing back to the mainland Britain in the morning, we planned to bag a smaller sea stack, Stack of Old Wick, on our way (back) to the north-west Highlands towards Old Man of Stoer. However, we found the fence-posts, on which abseil anchors are supposed to be rigged, were all wobbly, and the climbing didn't look very inviting. Instead, we spent a few hours in the nearby single-pitch sea-cliff, Latheronwheel, again under blue sky. It is certainly an underrated crag, simply because of its remoteness from the rest of Britain! 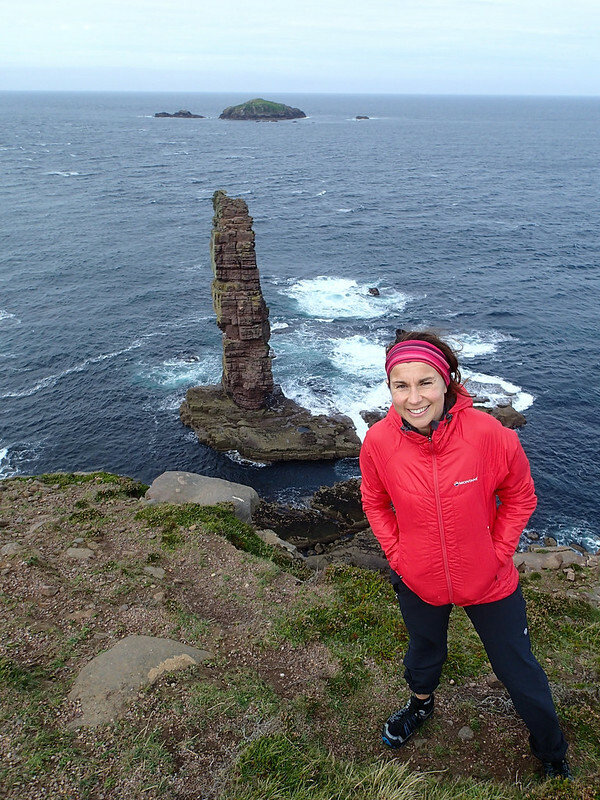 The following day was practically the last and only chance for us to climb Old Man of Stoer. The weather in early hours looked dry enough. The low tide is at 5 am/pm, which is pretty much the worst timing. But the tide is less an issue in Stoer, and so we didn't make the alpine start, and arrived at the opposite shore at 8:50 am, 1 hour after the mid-tide, after a usual ritual of hairy scrambling down the steep rocky path from the cliff top. Old Man of Stoer, half an hour before the high tide. Original Route starts at the point, where the Tyrolean bridge is set up, and P1 traverses to the left. 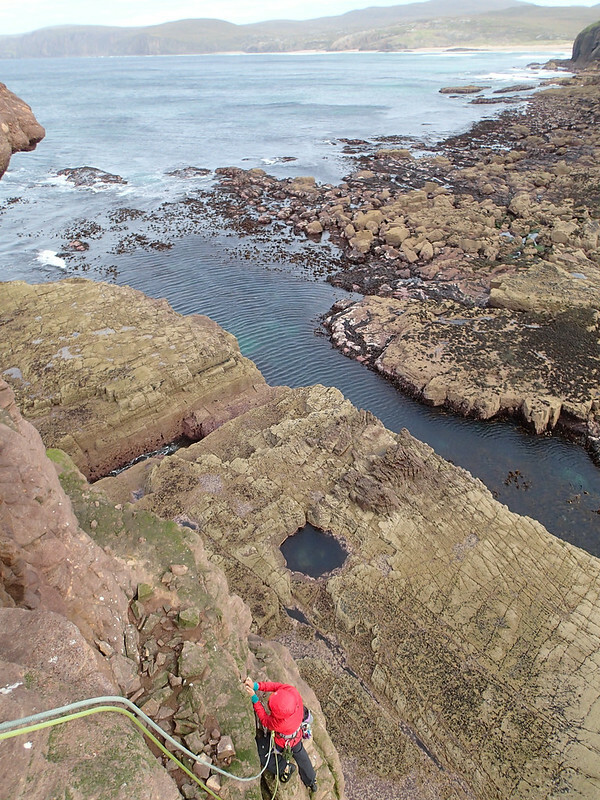 The bottom belay ledge is washed out by occasional swells, and even the P1 belay at the little platform at the bottom-left. To our relief, we found 3(!) in-situ Tyrolean-bridge ropes rigged. Though a sheath of one of the ropes was half ripped, at least one of them was felt solid. No need of swimming or rigging Tyrolean for us! 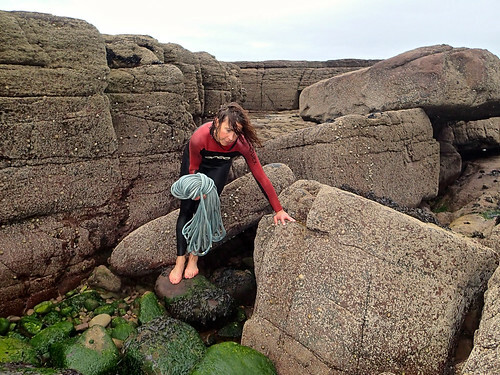 Much later I learnt the best in-situ rope there had been rigged by one of my friends, Ross Cowie, a few months before. Considering the rig was a few months old, the rope was surprisingly taut! Anyhow, the water in the channel was too rough to swim across. In fact, it was so rough, the first belay ledge was often washed by swells…. Technically, we could still get to the bottom of the stack and climb. But wet feet, or perhaps wet legs, would be in order. Also, depending how much the Tyrolean ropes sag due to the weight while traversing, our bodies may get considerably wet during the traverse, too. Worse, holds in P1, which is the crux, may well be damp. We decided to wait to pass the high tide. After 4 hours of waiting, the sun is gone behind clouds, but at least the tide has ebbed enough and the sea has become slightly calmer. The first belay is not washed by waves any more. The time to crack on! The Tyrolean traverse (the first time for Michelle!) went well without drama, and then I took on the lead. Both the rock and gear were good except P3, but the route-finding was found to be problematic, and we felt it was technically a little undergraded. On P3, I went off-route diagonally rightwards for 10-15m; the part was a nice VS 4b on its own, but I had to reverse back down and to climb up leftwards to get back on route. There was no in-situ belay in the P4 belay, which confused me, too. However, it started raining a little by that time. Time is pressing. I made a belay quickly, and then after Michelle came up, I blasted through the undergraded top pitch (P5) to top out to glory, followed by Michelle. We then hurried to abseil off, Tyrolean-traverse back, and to walk back to the car, just in time before the heaven opened up properly! Again, the luck was with us! Laborious Tyrolean traverse in/out to/of Old Man of Stoer. All the three ropes were in-situ, though one of the ropes was badly damaged with the sheath of completely stripped for one-third of its length. Before the trip, Michelle said she would be happy if she has climbed one sea-stack. As it turned out, we completed the trio in our limited time of mere 5 days! Marvellous. The weather goddess was so kind to us. It rained, but only while we were travelling or during night, except the last pitch of Stoer. And the sea was calm enough at the right time (mostly) for us to manage to make it. What a luck! We find sea-stack climbing, certainly of any of the Big Three, is an adventure. Climbing is (perhaps) the main part, nevertheless I would say what counts most is the whole experience. Sea stacks are not as big as Alpine walls or Himalaya. However the adventure packed in its relatively small size is so rich and awesome! They are one of the best Britain can offer for summer climbing adventure, for sure. First, less frequently a route is visited, the guidebook grades should be taken with a pinch of salt. Sea stacks are a stack for a reason; the rock is usually not very stable, and so the grades can easily change over the years, even if the initially given grade was spot on (and there is of course no guarantee for it). For example, the grade of 4c for P3 of Original Route in Am Buachaille was probably right, as I confirmed, but only if you find the right move, which is not obvious at all. Also, considering the quality of rock and gear, it is not quite for faint-hearted. And, climbers have to deal with many additional factors, such as tide, conditions of the sea and weather and its change as time passes by. That definitely adds a stress to climbers, in addition to the objective danger. 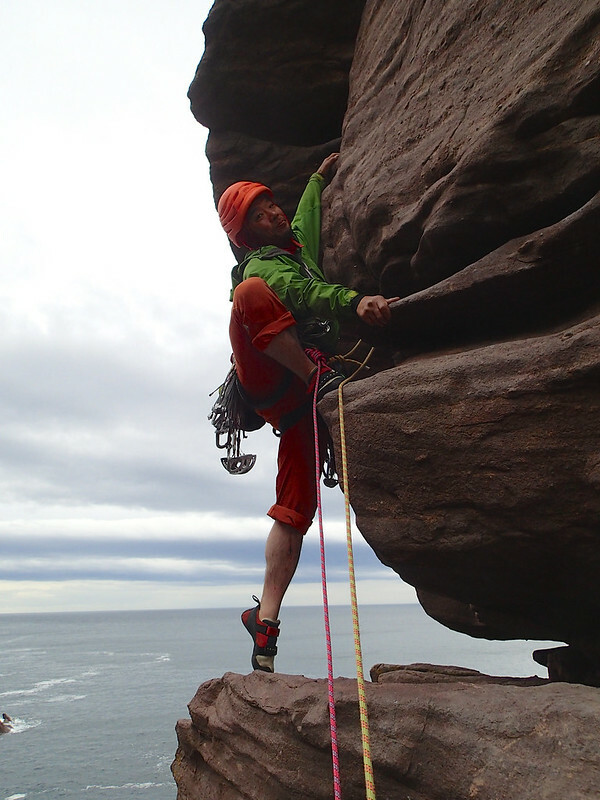 Masa on P3 of Original Route, Old Man of Stoer. Taken by Michelle. All rights reserved. In short, I argue climbers should choose a route on a sea stack so the grade given is well within the leader's grade, rather than the top grade on less committing situations, such as, single-pitch road-side cragging. Also, climbers, at least leaders, should be competent and well equipped to deal with the additional factors, such as, swim-in/out in Am Buachaille and Tyrolean-traverse and its rigging in Old Man of Stoer. As an example, in the initial traverse pitch of Old Man of Stoer, I lead 2 pitches in one go with double rope, but using only one rope to protect myself, so I belayed the second from the ledge directly above the traverse part, that is, the second was belayed with a rope from the above and the other from the side. That is probably the safest set-up one could get to belay the second, if hard for the leader who inevitably suffers from a terrible rope-drag in P2 (because he should not extend runners much during traverse so as to protect the second well). Still, Michelle testified in seconding if she had fallen off at the crux, she would have ended up in mid-air (due to the bulge above in the traverse section), or potentially would have got wet, falling into water due to rope stretch. Had it happened, either or both the belayer and second should have been able to deal with it safely, or otherwise it could be serious, for water is involved. Considering the risk of a change of the sea and weather conditions, swift ascent is desirable in any sea stacks. 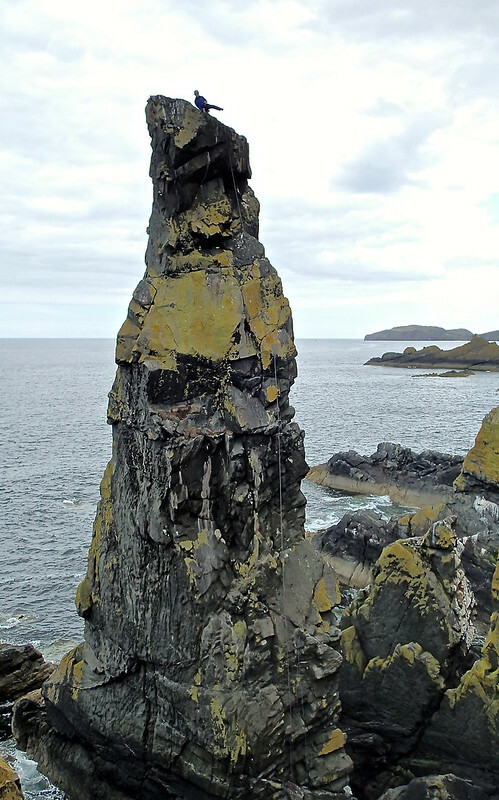 Be warned you can't get the mobile-phone signal in many of Scottish sea-stacks. Even if a rescue call is successfully made, the rescue action is likely to take many hours particularly in poor weather, where a chopper can not be used. Therefore, any party should be competent to perform self-rescue in case things go badly wrong. Among the Big Three, perhaps ironically, Old Man of Hoy is the least serious, though it is technically the hardest in the easiest route up and requires a long journey (car, boat etc) to get to and come back. Still, its abseil descent can be quite tricky, and the seriousness should not be underestimated. As for the gear for swimming approach, we took swimming-suits and/or wetsuits, drybags for climbing gear, towel and clothes to change, and snug-fit sandals (not flip-flop) to land on rock after swim. For Tyrolean-traverse, a few ascenders in a party are a must. A handled jumar is also very helpful in traversing, or else leather gloves are highly recommended (providing you are strong enough to pull on a rope with hands). We took a static rope, maillons, rope-protectors, and pulleys for rigging the Tyrolean. We climbed the sea-stacks in mid-September and I think it was the best season for it. The sea water is close to the warmest in a year, while the air temperature is not as low as October, and the day time is longer than in October. Some midges are still around and are annoying enough, nevertheless are no comparison with in the beginning of September, as I heard from the locals. Also, we found no obstructing birds on the stacks, which may be a big trouble earlier in the season. 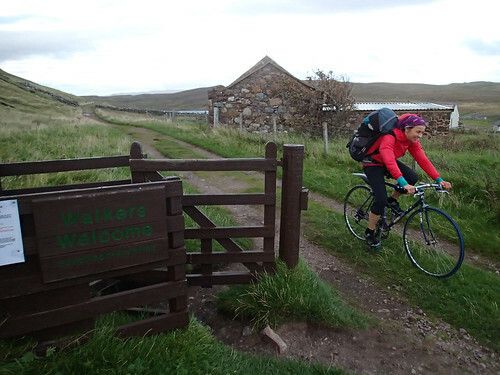 By mountain bike you can bike up to the point where you leave the good path (a part of Cape Wrath Trail to Sandwood Bay) to walk across the field (bog). We took a town and a road(!) bikes, and left them in a little parking space, where you can lock your bikes, before descending to the shore of a lochan. Even though we had to push our bikes at times on a rough terrain, it was still much faster and easier than walking all the way from/to the carpark. The descent from the cliff top to the shore is the worst among the Big Three with no established track, and is very precarious on loose, crumbling and wet rock, mud and vegetation. The top of some boulders in the shore opposite of the stack seemed to be above the (spring) high tide line, where we left our sacks. The bottom belay ledge seems to be submerged during high tide, and so it is not a good idea to leave gear loose there. 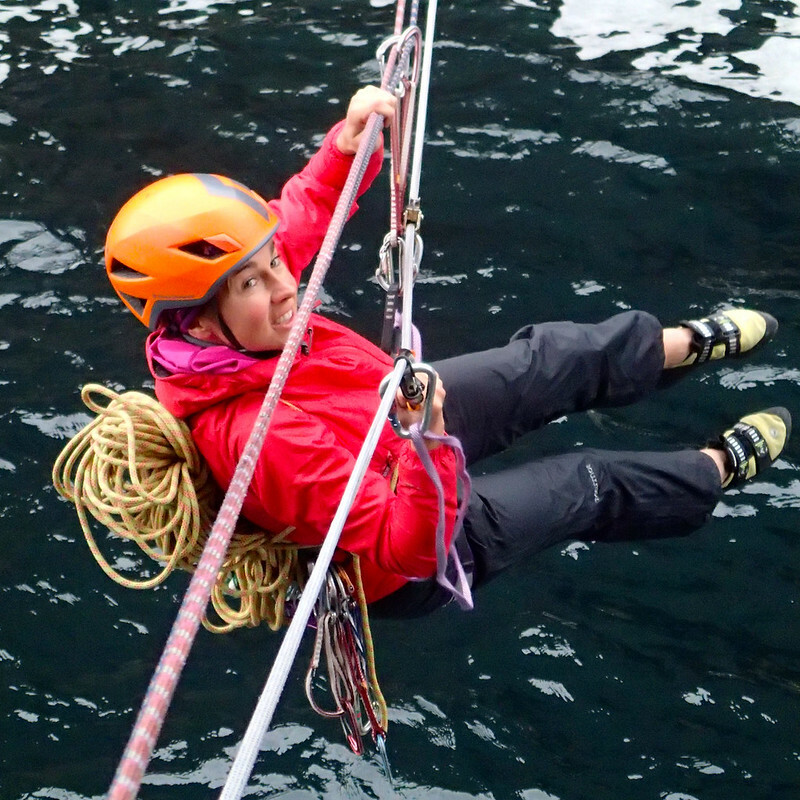 A pair of 60m ropes would be enough to abseil from the top to bottom in one pitch. Even 50m double might be suffice (I am not sure). 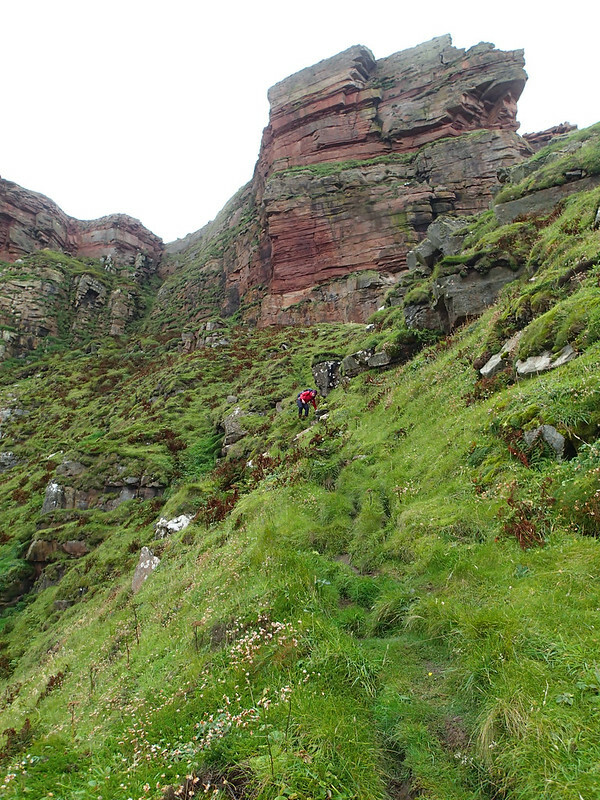 Precarious descent approach to the foot of Old Man of Hoy. Unless you take a car by ferry or use your own boat/canoe, the best approach is to take a passenger boat from Stromness in Mainland of Orkney (be warned the pier is a little obscured!) to the pier in Moaness in north-east coast of Hoy (I don't know whether and how frequently it operates out of the summer season). You can take your (road) bikes with you in the boat with no additional fee. 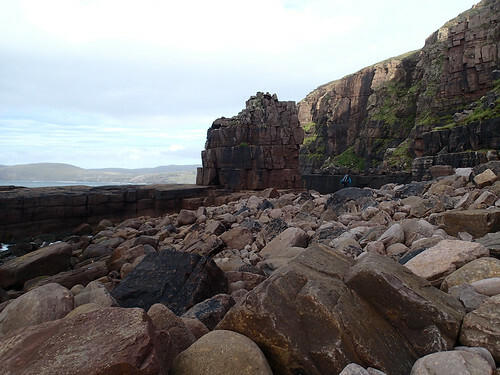 It is 8-9 km on a surfaced road from Moaness to Rackwick in the west coast, from which the footpath to Old Man of Hoy starts. It is 1.5 hours walk, including a steep descent, to the foot of the stack. The descent from the view point to the base is precarious (particularly in the wet, I suppose), but not as bad as those for the other two, and is a walk down rather than scrambling down. There is a more direct way (narrow road to the cul-de-sac and footpath) from Moaness and Old Man of Hoy (a friend of mine suggested it would be probably quicker even by bike to take that direct way, that is, biking as far as you can go and walking the rest, if it is for a day trip). Instead of a bike, you can use public mini-bus or private taxi (booking mandatory; n.b., a friend of mine said the pre-booked taxi had not turned up in his return trip, though…). 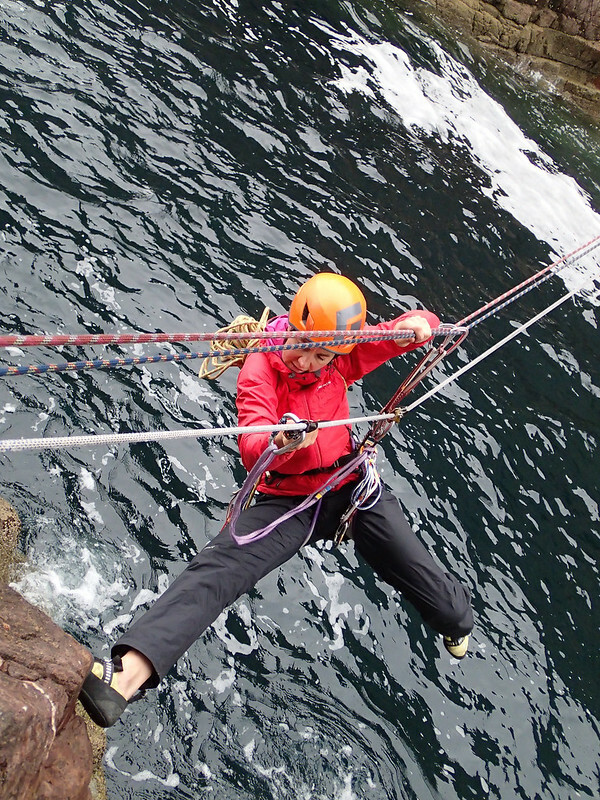 A pair of 60m ropes is highly recommended for the convenience in abseil descent. Or, 70m is even better, as we used, with which you can abseil from the top to the bottom in 2 pitches only. If using a 50m double, guidebooks highly recommend to take a third rope and to leave it at the second pitch (providing you climb Original Route), while ascending, to negotiate the diagonal abseil descent later. Mind you, it seems not uncommon the rope gets stuck at that stage (the P2 belay or one above) in abseiling, as a few people have testified in the UKC logbook. Indeed, we too spotted a deserted and tangled rope there (I later found the rope had been left there since only a couple of weeks before our ascent). 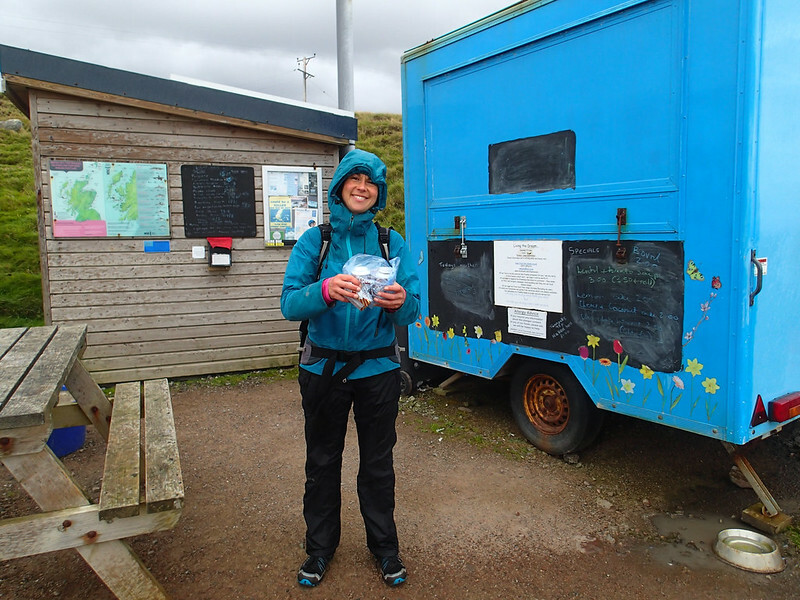 There are a youth hostel and open bothy in Rackwick. Prior booking is mandatory to stay in the youth hostel by phoning during 9 to 5 weekdays, at the time of this writing. 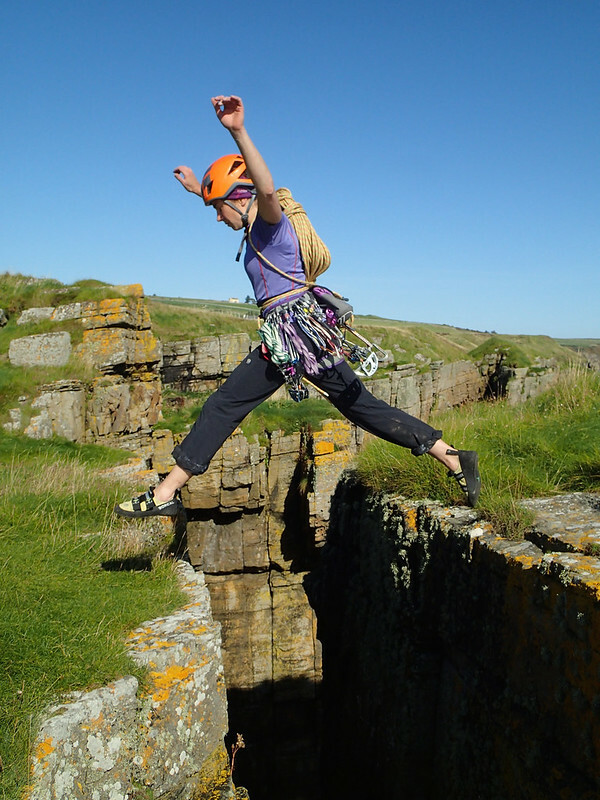 Allegedly there are other climbing routes at the highest quality in nearby seacliffs, and so it makes sense to stay longer and sample them before/after Old Man of Hoy. 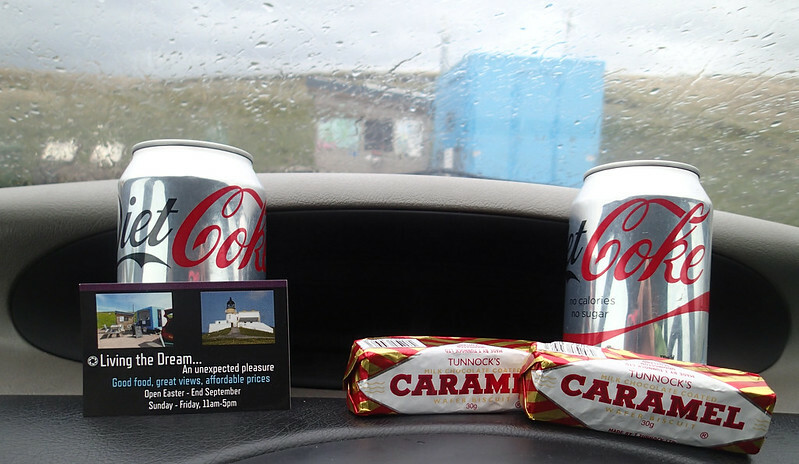 Parking is available near Stoerhead lighthouse, where a (very nice) blue tea/cafe van is open between Easter and September at 11am - 5pm. When we came back to the Stoerhead carpark, we found a plastic bag on the windscreen of our car. It was a gift from the owner, Leigh, of the blue tea van in the carpark, Living the Dream, with a message card! Hope you have had a good day of climbing! What a nice surprise! We were first baffled, because we didn't even see her in the morning as we had left long before the cafe was open. She must have guessed (correctly) we had gone climbing, judging from what was left in the car, like a climbing guidebook. After a long day, we were tired (though satisfied), and by that time the heaven had properly opened. Then this gift brightened up our day! I later posted a message of thanks to their Facebook page. To my more surprise, a friend of mine, who spotted my post, commented on the thread, saying he had received a similar favour, when he visited Stoerhead just like us, and thanks to Leigh. She is a legend! The descent to the base from the cliff top is the steepest among the Big Three, though the rock is solid unlike Am Buachaille. You may want to take off and lower off your rucksack in a couple of places, particularly if wet, and/or to put on climbing shoes. Technically, the base of the stack, where the first belay of Original Route is, is accessible in any tide by swimming in or (if there is in-situ rope left) via Tyrolean traverse, as long as the sea is calm. However, the first belay ledge can be washed out by swells in rough sea. Also, in Tyrolean-traversing, you are far more likely to get wet more or less in high tide as the rope sags. Allegedly, in the lowest tide in very calm sea, it is possible to access by boulder-hopping from the north by 100m. In fact, our walk-out was at pretty close to the neap low tide, but there still was a water channel, so the timing must be rather tight and maybe only during spring tide? For that reason, it must be almost impossible to fit in the climbing, while the tide is low enough to use the way for both in and out. 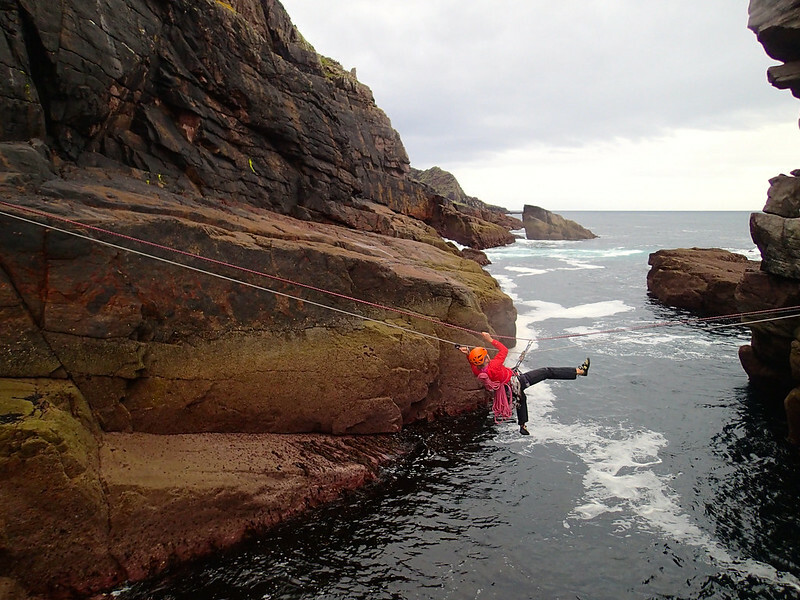 Tyrolean traverse at (or from) Old Man of Stoer. The right side is the stack side. The mainland side of the Tyrolean traverse is slightly higher (though not much) than the stack side. Therefore, to come back is a harder work. Mind you, the main anchors in the stack side are old rusty pegs (it was backed up by a shiny hex as in September 2016, but the hex wasn't taking any weight), and didn't appear to be most trustable. If you rig your own (retrievable) Tyrolean bridge, you are advised to take at least a maillon or krab to leave, as the gate of the in-situ krab(s) may not be accessible (too tight). For the abseil descent after climbing, it is possible to abseil directly from the top (last belay) to the first belay, where the Tyrolean is set up. We managed it in a single pitch with a very stretchy 50m double rope (Beal Iceline 8.1mm), but only just, with less than 1 metre in each and to spare after a considerable rope stretch by our body weight. There are multiple in-situ belay stations along the line of abseils, and so it is easy to split the abseils to a couple of pitches. The lower part of the abseil is free-hanging; therefore if you pitch the abseil, you had better pitch earlier than later. The crux pitch of the standard (easiest) route, Original Route, is VS up to 5a, and its crux 5a pitch is the P1 and traverse above water. Some climbers solo P1 as Deep Water Solo (though they still must take or somehow transfer the gear). Or easier, you can skip the pitch to get to the P1 belay with a longer swim (or by inflatable). Mind you, in that case you can not leave the gear/clothes like wetsuits at the bottom, but must take them with you while climbing, unless you opt to swim back after climbing, as opposed to go back via Tyrolean. The rock of Old Man of Stoer was, unlike the other stacks, felt solid, it being Torridonean sandstone, which is similar to gritstone. However, the route-finding in upper pitches of Original Route can be problematic, as testified by many climbers in the UKC, including myself. Also, we felt it was rather undergraded for both technical difficulty and gear availability. The P1 was more like 5b, unless I missed the best move, and I felt P3 was poorly protected E1 5a on its own, as opposed to the guidebook VS 4c, but then the line I climbed, though was a heavily chalked and most obvious one, might not be the best one (there are choices of the line according to the guidebooks). David Linnett shared the video in the UKC of their ascent of Old Man of Stoer via Original Route. A very fine video, though if you wish to onsight the route, you had better refrain watching it! Interestingly they too climb the same line in the video as we did in P3 with a similar runout, and they make P1 look very hard, which may support our feeling of it to be undergraded. Note: All the photos here are taken by Masa Sakano, and the license is Creative-Commons Attribution ShareAlike 2.0 (CC-SA-2.0), unless otherwise noted.